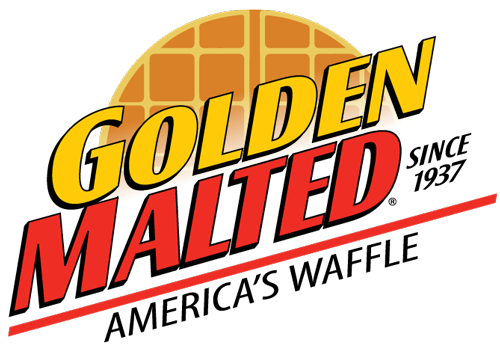 Carbon's Golden Malted Classic Syrup - Thick and Rich! 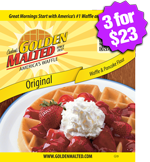 Give your Golden Malted® Waffles and Pancakes the topping that they deserve! 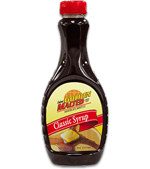 Our classic syrup is thick, rich and the perfect way to top your family’s favorite items. 3-Pack (3 x 12 oz. bottle) $3.09 per bottle - SAVE $1.50! 12-Pack (12 x 12 oz. bottle) $2.92 per bottle - SAVE $8.00! 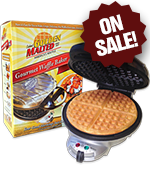 INGREDIENTS CORN SYRUP, HIGH FRUCTOSE CORN SYRUP, WATER, CELLULOSE GUM, SALT, MAPLE FLAVOR, SODIUM BENZOATE, POTASSIUM SORBATE (AS PRESERVATIVES), CARAMEL COLOR, CITRIC ACID, ASPARTAME.